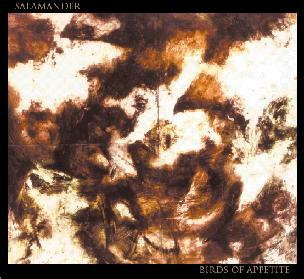 Salamander - "Birds Of Appetite"
The Minneapolis space tripsters return with their third release, this one a 2-LP set on 220g vinyl. The members of Salamander have been involved in a number of interesting projects including Gentle Tasaday, Vortex Navigation Company, and more recently, Skye Klad (see review this issue). The band consists of Sean Connaughty on electric and acoustic guitars, loops, percussion, shenai (an Eastern oboe-type instrument), and vocals, Doug Morman on bass, Erik Wivinus on electric and acoustic guitars, hammered dulcimer, e-bow, samples, vox organ, and vocals, and Matthew Zaun on drums. In a nutshell, this is a killer set of improvisational psychedelia with heavy doses of space drone when the band goes electric. "Vessel Is Vacant" and "Minutia Divine" are very cool acoustic tunes with the former featuring Eastern ragas that fill the air and sweep through your brain. Acoustic guitar and dulcimer trip along with tribal clay hand drums for a peaceful paisley colored journey. And Sean's vocals on "Minutia Divine" give the music a strong 60's flavor that I enjoyed. "Ithsmus" is a standout track with floating guitars, steady drumming, and vox organ gives an extra cosmic element to the mix. Wailing guitar soon joins in adding a harsher psychedelic sound to the meditations. The pace and intensity build slowly as this 10 minute track develops, mixing drones, touches of shoegazer, and beautifully molten rumbling psych guitar. "Sadhu" and "The Wreck Of Old 99" are similar extended tracks of droning space psych, with The Wreck again letting the vox organ kick things up a few notches into space. "Trench Of Fire" is a 20 minute epic that opens with a variety of quietly tripping and somewhat more experimental guitar sounds that gradually build the foundation for an acidic space symphony. The atmosphere gets increasingly aggressive, though the pace remains slow, with rumbling metallic guitars, mechanical space guitars, and a thudding rhythm section. Things get mucho Stoner space psychedelic... Farflung meets Black Sabbath in space. KILLER! Fans of cosmic guitar driven psychedelia should put this at the top of their want list.